Gathering information from customers is the most valuable skill an entrepreneur can practice. The qualitative nature of interview-based research gives entrepreneurs the chance to dive deeply into the problems and emotions a potential customer is feeling. It’s those feelings that the entrepreneur will ultimately resolve that will lead to their success. Would you use a product that does ______________? How often would you use a product that does ________________? How much would you pay for a product that does ______________? The result of these surveys is that students either confirm their bias that there’s high demand for their product without discovering the emotional ways customers describe their problems, or they conclude there isn’t sufficient demand, leaving them without any actionable next steps either way. While surveys have the allure of producing statistically significant data, statistically significant data on people’s predictions of their own behavior aren’t worth anything – especially in terms of business model validation. If we really want to answer questions like how much customer will pay for a product, there are far more effective ways of doing that than surveys, for example, selling pre-orders. How do we show students interviews are more powerful than surveys? In our Surveys vs. 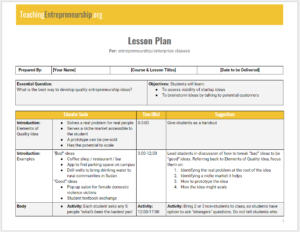 Interviews Lesson Plan, we provide an experience that will demonstrate to your students just how much more effective interviews are than surveys, by having them complete both experiences, and compare them. With this background, they begin figuring out how to test those hypotheses. Before class, ask your students to complete a Challenges Survey (find a sample in the lesson plan). Your students will be asked questions about the problems they face and how they have tried solving those problems. Start class discussing with students the pros and cons of asking customers about their problems using surveys and using interviews. Each method of validation has pros and cons, as highlighted below. After the discussion, show this table and highlight any relevant points. Let students know they will now experience these differences. In the lesson plan, we guide you through a conversation with your students about this surveying experience. First, discuss why some students did not complete it. Then transfer those reasons to customers from whom they want to gather information. Next discuss what it felt like completing the survey, and how much emotional depth they provided. We then guide you through introducing your students to customer interviewing. In groups, students will experience being interviewed, interviewing, and taking notes/observing. In these groups, students will ask and answer the same exact same questions from the survey, but in a format that’s much more conducive to problem validation. Students feel the benefit of interviewing as a hypothesis validation tool. Students practice customer interviewing. They learn how to be able to talk to anyone about their problems, so they can put themselves in a position to solve them. Below is the complete lesson plan of the Surveys vs. Interviews exercise. We’ve created a detailed lesson plan for the “Surveys vs. Interviews” exercise to walk you, and your students, through the process, step-by-step. I really liked the post, but you’re missing two major points around surveys vs. interviews. Surveys are impersonal while interviews are not. This is important because the personal nature makes interviews a more uncomfortable situation for most students, many of whom will avoid direct personal contact in favor of text (even over emails, and especially over leaving voicemail messages these days). I make them do interviews before doing surveys, and this is the overarching theme I’ve always heard from students. Sidestepping the issue in the article does a disservice to the faculty who will try the interview approach. Related to this is the second reason, ease of coverage. If you’re not close to your intended market (you’re in a remote college town and your market is urban, or same college town but you don’t know older people or parents, etc.) it is much easier to find or recruit (or pay for) survey respondents where you need them than find people to interview face-to-face. Yes, Justin has that wonderful hack using Mturk and Google Talk (https://customerdevlabs.com/2012/08/21/using-mturk-to-interview-100-customers-in-4-hours/), but getting students to that level of comfort and chutzpah probably takes more time than any of us have, and again, lots of them are not really comfortable talking to people on phones much less video. In reality, finding interviewees is emotionally more taxing and draining on the student than finding survey respondents. Be aware of this, be sensitive to this, and think of tweaking the next version (or the posted version) of this exercise to account for these things. BTW, it is possible to design surveys that are a lot more sensitive and better at hitting follow-up questions, so that part of the table is I think a bit of straw-man reasoning. When I was at UMich’s ISR, it was part of the training, but today the info is more widespread. One of the best examples I’ve seen recently is Ryan Levesque’s Ask Method. He makes it look and sound a lot easier than what they taught me 40 years ago, but that is true of so many things, including your stuff. Thanks for sharing this Jerry. I think you’re bringing up some great points that are shared by a number of professors. I also love how the crux of both your points is to be sensitive to how daunting and awkward interviews are for students, and I think you’re right on both accounts: students will avoid direct personal contact whenever possible and it is easier to find survey respondents than it is in a remote college town. Surveys assume you know the right questions to ask. In truth, when students are doing problem discovery, an interview script is a very rough scaffold that provides a framework for a conversation, but I’d estimate 80 – 90% of the questions they’ll ask will be improve – inspired by the previous answers of their customers. Asking for clarification on jargon, asking for more details about a specific aspect of their problem, asking why until an emotional motivation is found, etc. Where surveys require students to know what they want to ask ahead of time, interviews give students the chance to probe and discover new problems in real-time with limited knowledge of a subject matter. Emotions are extremely difficult to discern via surveys. Emotions will form the basis of our student’s marketing content, and the difference between asking someone on a survey, “What feelings to you experience when you think about that problem?” versus being able to empathize with someone during a face-to-face discussion (virtual or otherwise), “I can totally see why that’d be a problem. I’ve experienced the same thing. So that I don’t conflate your experience with mine though, can you tell me what feelings came up for you in that situation?” are worlds apart. On top of not being able to empathize in real-time, of course there’s not chance to read the non-verbal communication of your interviewee. So while I agree with you, students aren’t comfortable doing interviews, I don’t think surveys are the right solution to that problem. Instead, I think we need to do a better job helping students become more comfortable with interviews. I can’t claim we have the right answer on how to do that, although we’re working on some lessons that we’ll be sharing in the next few months and will be testing at our USASBE Happy Hour party you’ll be there. but I’d rather see our energy put there than on teaching what I view as an inferior customer discovery tools. (Baby just woke up so I need to run but…) If you or anyone else has examples of surveys that address the issues above, I’d love to see them and re-evaluate my perspective! ISR and NORC used to do all surveying by mail or door-to-door or by phone. They usually did pilots in person because when they asked a question (even if they were giving the respondent the answer choices) respondents would often ask questions about the choices, or display confusion or some other response, and pilot testing surveyors were trained to pick up on and explore these as a way to get insight on the question and its shortcomings. You’re right about getting more from oral surveys. Think about your example for the Google Talk survey on your own website. Think of all the additional comments the respondent made.